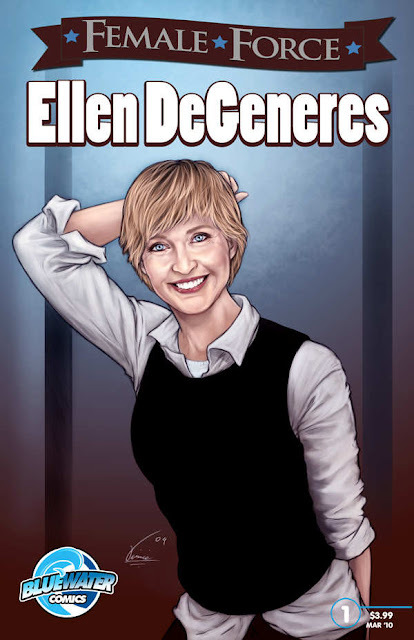 A comic book featuring our favorite vegan comedian, Ellen DeGeneres, will hit the shelves on March 31. Female Force: Ellen DeGeneres, brought to us by Bluewater Productions, will follow Ellen’s life from her time as a child in Louisiana through her time in the comedy club circuit to present day as an Emmy-winning daytime talk show host. The 38-page comic book will also touch on Ellen's love of animals and will include a section about her wedding to Portia De Rossi. A portion of all proceeds generated by the sale of the $3.99 comic book will be donated to the Humane Society. “Ellen and her organization were very generous by embracing this book. That's why we are happy to share a percentage of the proceeds with her favorite charity; the Humane Society,” said Bluewater president Darren G. Davis. Click here to purchase Female Force: Ellen DeGeneres on Amazon.com.